You are here: CollectionsOnline / Italy: unidentified location near ? Lago Fucino or ? Pozzuoli. View of a subterranean tunnel with vaulted archway and walls showing details of construction; roof in part collapsed. This is another sheet from the dismembered Lago sketchbook, and, in its depiction of the brick and tufa construction, this drawing is close compositionally to Adam vol.57/3. 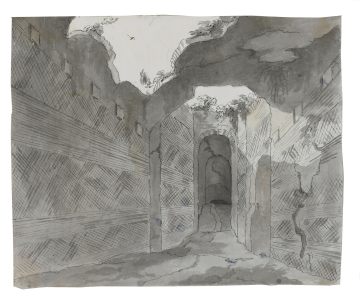 The drawing probably shows one of the tunnels at the Lago Fucino, but it is also possible that it depicts the interior passages of the amphitheatre at Pozzuoli, two views of which are found in Paoli, Avanzi Delle Antichita Esistenti a Pozzuoli Cuma e Baja, Naples, 1768, pls. XXIII and XXiV.